A new paper in Nature Communications reports unequivocal experimental evidence of tetrahedrally coordinated carbon in high pressure carbonates, obtained by combined experimental and theoretical studies. Only a small fraction of our planet’s total carbon budget is found at the surface. 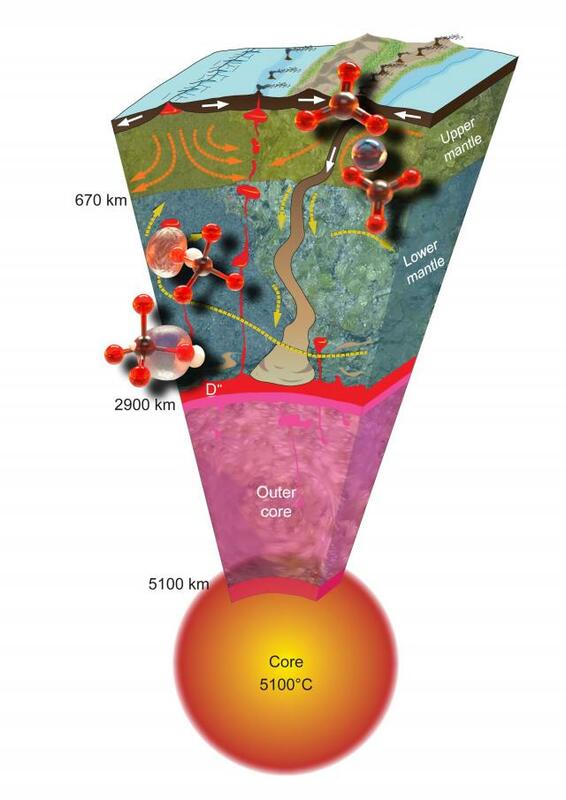 In fact, Earth’s mantle is thought to be the largest carbon reservoir. Carbonates, and in particular ferromagnesite ((Mg,Fe)CO3), are likely candidates for deep-Earth carbon storage and therefore play a key role in the deep carbon cycle. The behavior of these carbonates at the high pressure and temperature conditions of Earth’s interior is therefore of great interest for understanding global carbon cycling and storage. A new paper, appearing in the 18 February 2015 issue of Nature Communications, reports unequivocal experimental evidence of tetrahedrally coordinated carbon in high pressure carbonates, obtained by combined experimental and theoretical studies carried out in Wendy Mao’s lab at Stanford University (USA), Giulia Galli’s lab at the University of Chicago (USA), and Zhenxian Liu’s synchrotron infrared beamline, which is managed by the Carnegie Institution at the National Synchrotron Light Source at Brookhaven National Laboratory . Eglantine Boulard, Ding Pan, and colleagues combined in situ synchrotron infrared spectroscopic experiments in a diamond anvil cell with ab initio calculations on ferromagnesite. This coupled experimental and theoretical approach identified a unique vibrational signature present only in the high-pressure phase, and thus a new carbon-oxygen bond formed under pressure. In particular, Boulard et al. were able to assign the new vibrational signature to tetrahedrally coordinated carbons with asymmetric C-O bonds. Ferromagnesite represents an important rock-forming mineral group, fundamentally distinct from silicates in Earth’s crust; at low pressure carbon bonds to three oxygen atoms, while silicon bonds to four. Tetrahedrally coordinated carbonates, as described in this new publication, likely exhibit dramatically different behavior compared to three-fold coordinated carbonates, including altered reactivity with other mantle phases and changes in chemical melt properties. This bonding behavior could therefore have significant implications for carbon reservoirs and fluxes, as well as for our understanding of the global geodynamic carbon cycle. Images: While at the surface of planet carbon bonds to three oxygens in carbonates; in the lower mantle, under existing temperatures and pressures, carbon adopts tetrahedral coordination. Courtesy of Giulia Galli, Eglantine Boulard, and Sophie Lietar.